Redstone torches don't always make a burnout sound when they should. When the torch first burns out, it does not make a sound. When it randomly lights and burns out again later, it has a chance of making the burn-out sound. The torch burn-out sound should play each time the torch burns out. In 1.1.0.55, redstone torches made a burnout sound every time they were inverted. This was fixed in 1.1.1.0, but the fix introduced a new problem: they don't always make the burn-out sound when they burn out. If you create a simple redstone torch burn-out contraption, and cause the clock to start while the torch is on, the redstone torch will not make a sound when it ends up burning out. After a while, it will randomly turn on again and end up burning out again, but this time it will make a sound as expected. If you build a redstone torch clock and attach a lever and activate it to invert the torch and lock the contraption, and then deactivate the lever, thus turning the torch back on, the redstone torch will make a sound when it burns out. 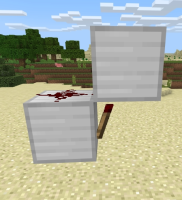 It seems that if the burn-out contraption is started by placing a block to complete the burn-out circuit, no sound will be produced, but if the contraption is started by use of redstone to un-invert the redstone torch, a sound will be produced.